What you may find yourself dealing with, is the annoyance of having to put in an Apple ID when you push out the Apps to the devices. Or maybe your end users are complaining that they have to enter their Apple ID or hit the "okay" button on the screen every time you push a new app. Wouldn't it be great if the app would just show up without you touching a single screen? Well... It can be that easy. But first of all. Let's get this out of the way. In a BYOD (Bring Your Own Device) deployment model, you will never be able to fully silently push apps. That is because, at the end of the day, you do not own the device you are pushing the App to, even if you are managing the device. So ultimately at the end of the day it is up to the end user to accept the App being downloaded onto their device. Keep in mind, non company owned devces should never be supervised. 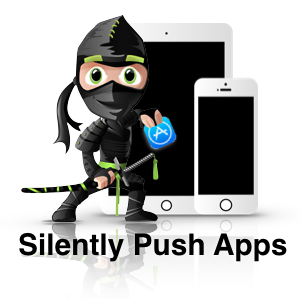 Which is a crucial in allowing you to silently push apps. You will only be able to fully accomplish this with devices that your organization has ownership of. So that means in situations where you own the devices and assign them to specific end users (COPE) or in situations where you have a number of devices that are shared amoungst multuple users (Shared Deployments) you are golden. We have built a guide for you to follow in order to become an app pushing ninja assasin. Click below to download your copy now.